I am a naturally positive person. I look for the best in people and affirm the good I discover. I try to cut those around me slack, believing that “there is always one fact more about someone that you do not know” which may explain their behavior. We all have a tough road to hoe at times. Worried about when your bananas will be ready to eat? Here’s a little help. This little display has left me with so very many questions. 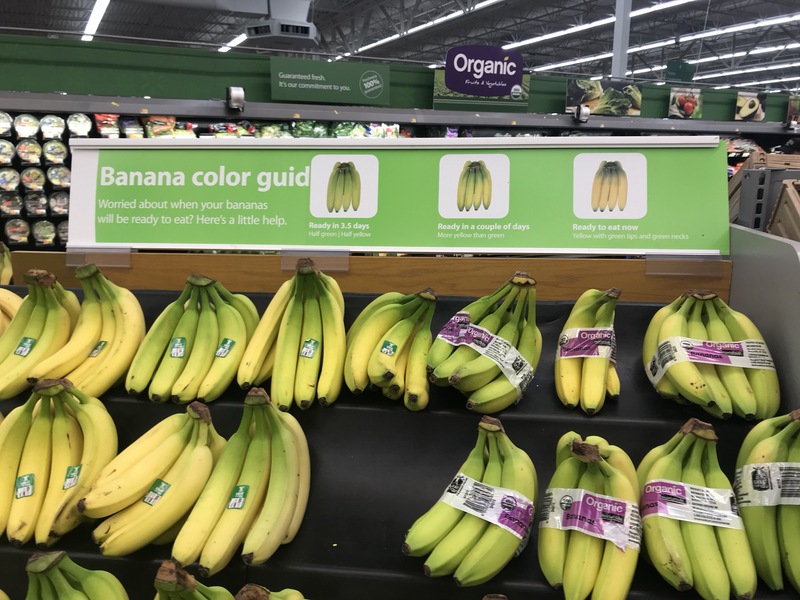 First off: how is the general population in need of a slick ad campaign to avoid eating green bananas? Secondly, just who is confused by the lowly banana? It is hardly the mood ring of the fruit kingdom one needs an illustrated guide to interpret, she’s pretty straightforward. Now the cantaloupe? Heck’s yea, I’ll take a melon hack all day long, those guys can be tricky. Watermelon: a dice roll every time. But a banana? Thirdly, who devised this brilliant display and why do they not have spell check on their computers? Why is the first picture’s ripeness approximated with numeric accuracy when the second is stated in lazy generalities? A few? Why was the passion for precision so quickly abandoned by, oh, I don’t know, the second example? Were the female banana models compensated equally to their male counterparts in this photo shoot? And if not would the males consider making up the difference out of their own pockets? Sadly, we are only privy to is the masterful end result not the making of. Signs like these make me believe the worst about us as a nation. We used to be smart enough not to eat green bananas. I remember growing up with the benefit of two parents mentoring me in the nuance of such weighty consumption decisions. I know, I was one of the lucky ones. In summation: God save the Queen if we are this pathetic. And, if anyone in our country has the luxury of banana anxiety amid the current natural and man-made disasters, I am more than half green with envy. Far more than just my tips and stems. And I do not need any silly guid to tell me that. Next postReally? Google Arts and Culture? Really?